Our December magazine is out now. 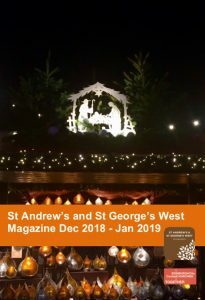 Very Rev Dr John Chalmers finds the place where God is with us; Sally Evans explores New Life at the Edinburgh Christmas Tree Festival and Pat McKerrow affirms that what we need is here. We revisit our recent service on homelessness while Tony Shephard contemplates the ancient Roman festival of Saturnalia. Plus: discover our programme of Advent and Christmas events – and take a first look at what’s on early in 2019.